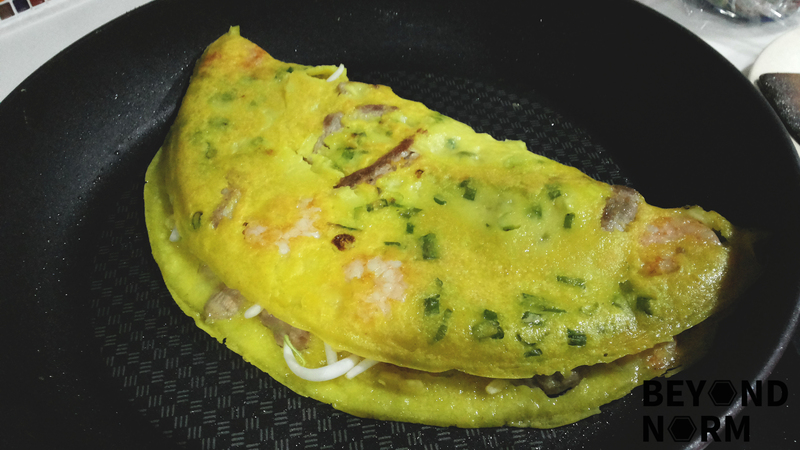 Bánh xèo literally means “sizzling cake”; you will hear the sizzling sound when the batter hits the hot pan. As we were in Ho Chi Minh City, it is natural that we have only tasted the Southern-style bánh xèo which contains coconut milk. I understand that certain central regions of Vietnam skip the coconut milk and sometimes the turmeric powder altogether. Most of the time, you will get prawns with their shells in bánh xèo but since I am making my own, I prefer to remove the prawn shells first. Don’t try to eat bánh xèo with a fork and spoon, it doesn’t work very well. Hahaha. This crepe is meant to be eaten with your hands, so make sure you have clean hands!! You need to have a big plate of greens (lettuce or mustard greens) topped with herbs (mint, cilantro and other commonly used ones) and wrap your bánh xèo. Then dip in a fish sauce dipping. Mmmm….. It is so good!!! In a bowl, combine the sugar, water and fish sauce together and stir it well till sugar is dissolved. Lastly add garlic and chilli. 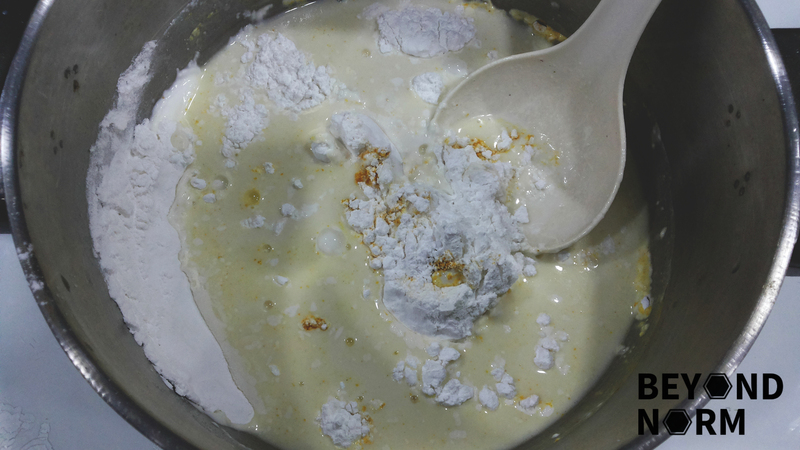 In a bowl, dissolve the rice flour, turmeric powder and salt in water. Add coconut milk/beer and chopped spring onions. Stir well and let the batter rest for 30 minutes. Remove the shells from the prawns and devein. Rinse and drain, then set aside. Slice the pork belly thinly or you may buy the ready sliced pork belly. 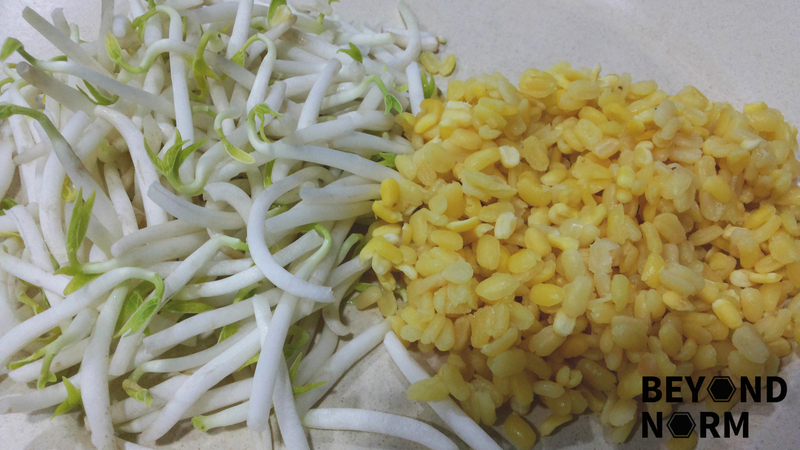 Remove the tail from the beansprouts. Rinse the mung beans till water is clear. Put into a bowl and fill it with some water to cover the mung beans. Then steam over medium heat for about 15 minutes or until the beans have reached your desired level of tenderness. Heat a heavy-bottom or a non-stick pan over medium low heat. Drizzle 1 teaspoon cooking oil into the pan. Add 4 to 5 prawns and a few pork slices and fry until they change colour on both sides. Spread the filling evenly on the pan. Stir batter well before you ladle about ¼ cup of the batter. Quickly tilt to evenly coat the surface. The thinner the layer the better. If the crepe turns out too thick reduce the amount of batter in your second crepe. 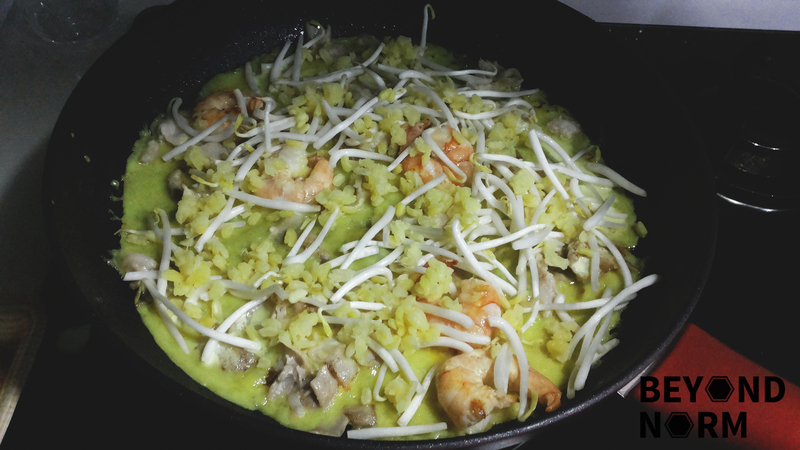 Top the batter with bean sprouts and mung beans. Place a lid over for about a minute. When crepe begins to curl up on the edges and turns golden brown and crispy, fold the crepe in half. Gently remove the crepe to a serving plate. Repeat with remaining batter and ingredients. 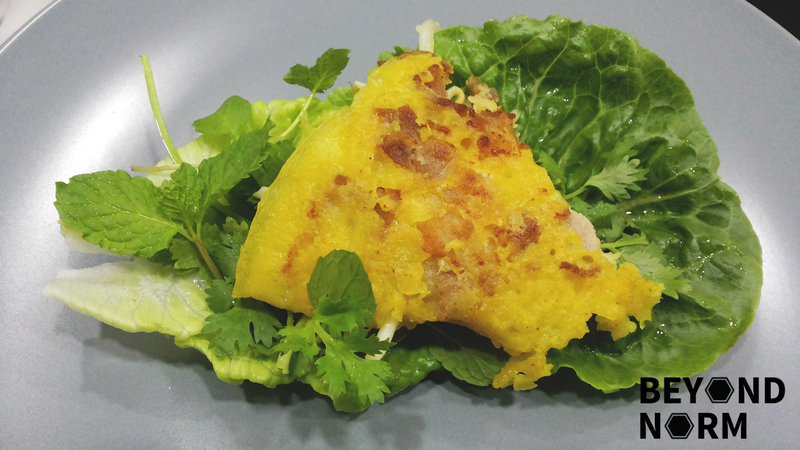 To serve, divide the crispy Bánh Xèo into 4 pieces. Take a large piece of lettuce or mustard leaf and place some herbs and a piece of the cut crepe on top. Dip in the dipping fish sauce and serve. The quantity for the fillings can be adjusted accordingly to your own liking. The number of crepes made will depend on the thickness of your crepes and the size of your pan.